Some of the people who make camp go. 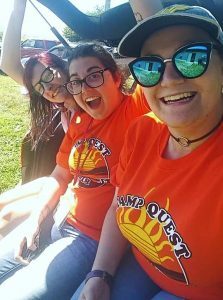 The second session of Camp Quest Northwest is over, wrapping up camp season for the year. Sam reprised his role as floating staff from June, and Becky managed a very active young camper cabin. It was a week packed with Flying Spaghetti Western goodness. In short, we’re exhausted. We need a shower, some sleep, and time with our cats. We’ll do a show this week, but on Monday or Tuesday. See you then.